For a Really Unusual Effect. Try the Crushed Flower Tutorial and use the flowers in your garden when they are just past their best. Gather them for this technique and make the pleasure of real flowers last a lot longer. And it is such a lovely look for your card designs. This card is very easy to do and it can give you some water coloured effects to your cards. When this idea was first introduced it took many people sometime before they realised that the flowers used in the process are actually real. There you will find some more ideas on how to dress the card. These additional touches will make your design truly individual. You will need a die cutter to get the result, so shop around before you buy for the best deal you can get. Experiment with different flowers and colours, as they all produce unusual effects. But don't expect the pressed flower colour to look anything like the original flower ... it won't .. it will look totally different. For instance the white flower that you have used may look lilac or pink at the end of the process. but it all makes for a pleasant surprise. 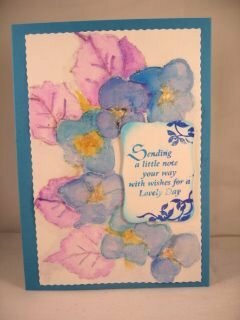 Pop it to one side and then once the crushed flower panel is dry you can layer it onto some Specialised card to bring out the beauty in your creation. Trace around the flower shape with a glue pen and sprinkle some glitter onto it to enhance the petals. 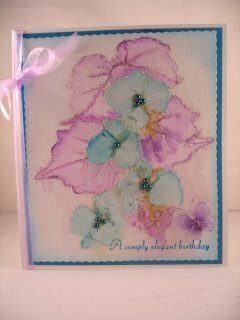 I have used Distress Inks to add a water colour effect to the flowers too. And in some gemstones, pearls or even buttons to the flower centres for another look. I hope you enjoy this Crushed Flower Tutorial, and although the technique is a bit messy... the result is well worth it in the end. And the recipient will think you are a whiz with a water colour brush...but we know! don't we?? ?